Malik Elamaireh, Ph.D., joined Integrity Action in July 2010 as Programme Manager of the Arab World Integrity Education Network. Malik has over 25 years of professional experience leading civil society organizations in the fight against corruption and to promote good governance in Jordan and the Middle East. He co-founded the Good Life Studies Center in 2005 where he served a general manager and lead researcher. He also helped establish Jordan Transparency Association and Jordan Political Observatory in 2008, and the Jordan Relief Association in 2003, among many others. Malik was lead researcher and author of numerous publications including the Global Integrity Report, Jordan (2008, 2009 and 2010), “The Jordanian National Integrity System” (2008), a public opinion poll on the state of corruption in Jordan (2006), and Proceedings of The Jordan Conference on Corruption (2006). 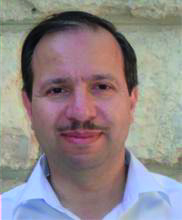 In addition to his anti-corruption work, Malik has been a professor in the Faculty of Information Technology at Amman Alahleyyah University since 1994 and head of the Computer Science and Information Systems Department since 2006. Malik earned his PhD in Computer Networks from Azerbaijan State Petroleum Academy in 1994.